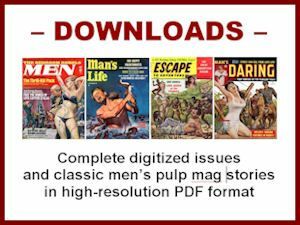 Editor’s Note: This is the second in a series of special guest posts by Tom Ziegler, author of BRUCE MINNEY: THE MAN WHO PAINTED EVERYTHING — a great new book about one of the top artists who worked for men’s adventure magazines in the 1950s, 1960s and 1970s. I bought both the the ebook version (which looks great on my iPad) and the large format paperback version (which I can confirm is nicely printed and worth the higher price if you prefer print books). In his first guest post here, Tom wrote about the genesis of his book and about how Bruce decided to move to New York City in 1955 to take a shot at becoming a professional artist. This second post picks up after Bruce arrived in New York. Most major publishers of men’s adventure magazines, like Magazine Management, had their editorial offices there, and they gave Bruce his first steady work as an illustration artist. His association with the genre became a long-lasting one. From the mid-1950s to the mid-1970s, Bruce painted hundreds of cover paintings and interior illustrations for men’s pulp mags. More than 300 of them are featured in Tom Ziegler’s book, along with commentaries by Bruce. It’s an awesome addition to the still relatively short list of books about men’s adventure magazines and the artists who worked for them. I give it my highest recommendation. My father-in-law Bruce Minney really did paint just about everything you can paint. 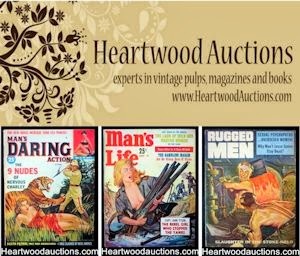 He spent 20 years working as an illustrator for men's adventure magazines, painting beautiful women, gorillas, lions, tigers, bears, elephants, alligators, headhunters, Nazis, airplanes, aircraft carriers, tanks, guns, and lots of explosions. He worked another 20 years painting covers for all kinds of paperbacks including western, historical romance, action, military, biography, and Gothic horror. He also did storyboards for advertising agencies. For a few years, he made award winning pottery and most recently, he is making mobiles, collages and paintings based on the collages. Bruce never made it to the level of Picasso or Jackson Pollock, but he was able to support a wife and two children doing art. Bruce started making the rounds with his samples. 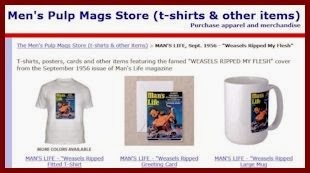 First, he visited the top tier magazines like SATURDAY EVENING POST and MCCALL’S. No luck. Then he began calling on the second tier magazines like ARGOSY and TRUE. No luck. Bruce continued to show his samples. Finally, he got some men’s adventure assignments, though initially he was turned down. It was through Balcourt that Bruce really began his career as a professional illustrator. 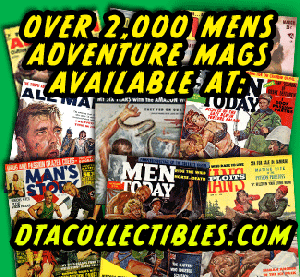 Balcourt also repped for many other artists who did illustration work for men’s adventure magazines during part of their careers, including Tom Ryan, Robert Schulz, John Leone, Norm Eastman, John Duillo, Basil Gogos, Charles Copeland, Rudy Nappi and Robert Maguire, among others. Art directors would call Eddie, who would pick up the job. Eddie would call Bruce and Bruce would go into the city to pick it up. When he was done, Bruce would deliver the finished illustration to Eddie. Bruce rarely talked to the art directors. For this, Eddie took 15%. After about a year, Balcourt started getting calls from art directors telling him they had a job for Bruce Minney. They also started calling Bruce directly if there were changes. 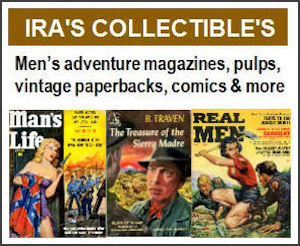 At first, Bruce worked almost entirely for Magazine Management, publisher of many of the top men’s adventure magazines, such as ACTION FOR MEN, COMPLETE MAN, FOR MEN ONLY, MALE, MAN’S WORLD, MEN, MEN IN ACTION, STAG and TRUE ACTION. Eventually, the brutal pace of advertising work convinced Bruce that it was time for a change. He had always been interested in sculpture, but he knew he couldn’t make a living at it. He took some pottery classes mainly to have access to a kiln and started to develop a style. He soon became quite proficient and decided that if he was going to make a living selling pottery, he needed to be in a state that had lots of arts and craft shows. In 1989, he packed everything into a U-Haul and drove to Florida, where he still lives. He made award winning pottery for almost 20 years and retired in 2009. Coming up in Tom’s third guest post: more excerpts from his book. In the meantime, you can read more about Bruce Minney in the 3-part interview he did for MensPulpMags.com last year.